Orcas Island, the largest of the San Juan Islands, located between the State of Washington mainland and Vancouver Island, is a true getaway that offers just about whatever you might desire in a tranquil destination — from stunning scenery and hiking trails to charming walkable village streets with art galleries and shops and its own unique cuisine. The rural island of Orcas, with its serenity and beauty, harks back to a simpler, easier lifestyle. There are no stoplights, chain stores or malls on Orcas. Instead you shop at local grocery stores where almost all produce consumed is grown right on the island. No one is allowed to drive more than 40 MPH. You might even want to hike or walk or ride a bike to your destination. Wildlife peacefully coexists with people on Orcas. 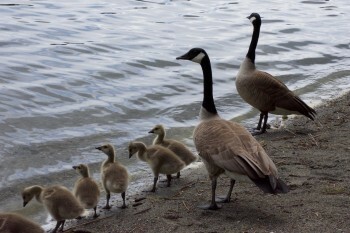 Rabbits, deer, geese, eagles, owls, and frogs live on the island along with the friendly residents and visitors. You can actually shop at flower or vegetable stands and leave your money in a jar. 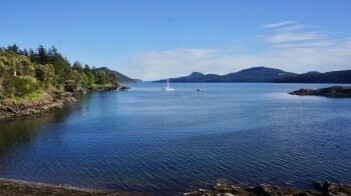 While most people think that Orcas Island is named for the majestic killer whales that inhabit the waters around the island, Orcas (shortened from Horcasitas) is named for a Spanish explorer who discovered the island during his explorations of the Pacific Northwest in 1791. Although you can reach Orcas by plane or your own boat, I think the best travel mode for most visitors is to do what we did. 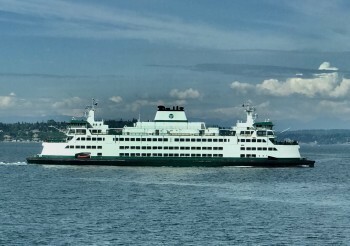 Just take the Washington State Ferry from the coastal town of Anacortes (about one and a half hours from Seattle) and enjoy a leisurely ride of about an hour to the island. You can actually make a reservation from Sea-Tac Airport in Seattle where you will board a shuttle that takes you onto the ferry and drops you off on Orcas Island. You also can drive your car on the ferry or walk right on. On the ferry, just sit back and relax or walk around the deck and enjoy the stunning views of Mt. Baker and the Olympic Mountains. You might even see some frolicking dolphins or whales. Go to the Washington State Ferry website to see the schedule and make a reservation. There are many welcoming accommodations available on Orcas from larger resorts to intimate B & Bs, inns and Airbnbs. 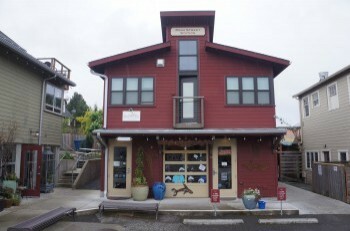 We stayed at the Sea Star Lofts overlooking the bay in the enchanting village of Eastsound. Above a boutique gift shop, there are four lovely apartments that are beautifully designed, spacious and comfortable. We loved staying here because we were right in the heart of the village and could meander from shops and galleries to restaurants and bars. 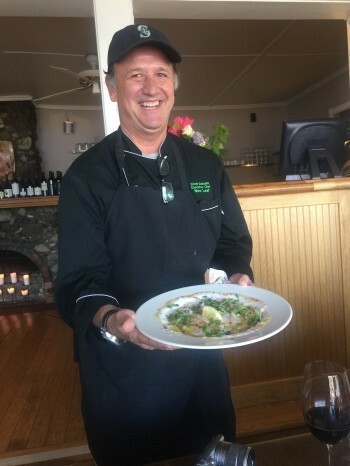 There are so many wonderful restaurants on Orcas, most featuring locally sourced fresh, seasonal ingredients. Here are descriptions of the places we visited, all of which I would highly recommend. This cozy, cheerful cafe, located in a renovated fire station in the village of Eastsound, is connected to an enticing deli with specialty grocery items, including cheese and wine. 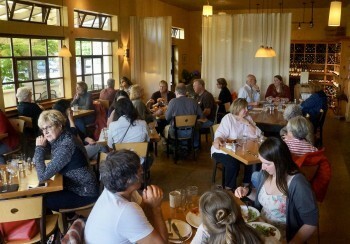 We learned that this restaurant’s dishes include organic, free range, and locally grown ingredients whenever possible. Artisan breads are baked in-house and almost everything is made from scratch. 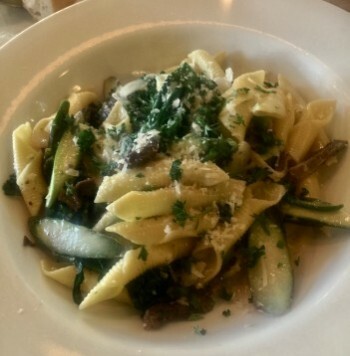 I enjoyed a delicious pasta dish creatively made with wild morels, English peas, purple asparagus, Parmigiano and white wine. My husband, Todd, savored an imaginative, thin-crusted pizza made with homemade Lucanica sausage, stewed poblano and onion, provolone cheese, and a zesty marinara sauce. And our epicurean traveling companion, Janice, relished Buck Bay oysters on the half shell served with crème fraiche and herbs. We all then shared a delicious rhubarb raspberry crisp that came with a scoop of house-made buttermilk ice cream. Before leaving, we picked up crusty bread, delectable cheeses, olives and wine for a picnic lunch the next day. 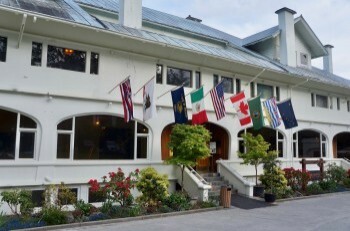 We were thrilled to visit the historic, majestic Rosario Resort and Spa, located right on picturesque Cascade Bay and founded in 1906 by Robert Moran, former mayor of Seattle. The hotel has recently been restored and its elegant restaurant, The Mansion, is a highlight of the resort experience. We had a wonderful gourmet dinner with each course introduced by the talented, personable chef, Raymond Southern. 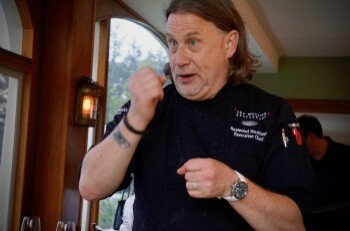 He described each dish and explained that ingredients are seasonal and locally sourced. We sat at a beautiful table with sparkling water views as the sun set. The dishes we were served were just as spectacular as the setting. Each dish was paired with a lovely wine from the Pacific Northwest that complemented the dish. It is nice to know that the staff at Rosario is well trained in suggesting ideal wine pairings. We first savored an Albacore Tuna Ceviche made with radish, cucumber, cilantro, red onion, and baby peppers and uniquely served with a refreshing cucumber sorbet. This dish was enhanced by a crisp 2017 Orcas Project Pinot Gris from Willamette Valley. Next we relished Fusilli con Coniglio e Pisello, a creative dish made with house-made pasta, rabbit belly, and pea shoots—all topped by an organic, coddled egg yolk. The accompanying 2016 DeLille Cellars Rousanne from Red Mountain, Washington, was rich enough to hold up to the dish and yet mellow enough to not overpower it. Our two heavenly entrees were served with the 2016 Savage Grace Cot from Washington’s Boushey Vineyard. 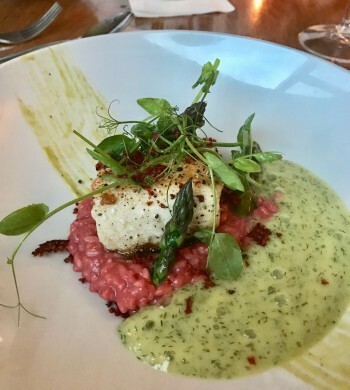 The flavorful pan roasted wild Salish Sea Halibut sat on a bed of red beet risotto with a savory asparagus sauce and dill foam. The Seco de Carne, a Peruvian-style beef stew, featured peas, carrots and potatoes and was so delicious. The wine was fruity and smooth and bold enough to match the dishes. Finally we concluded this feast with a slice of Orange Ricotta Cheesecake with a luscious blueberry sauce. The 2013 Brian Carter Cellars Opulento from Yakima Valley, Washington, was subtly sweet and delectable. I would strongly suggest that any visit to Orcas Island include this exceptional restaurant and perhaps a stay at Rosario. You will enjoy the peace and beauty of this lush setting. Another not-to-be-missed dining destination is the New Leaf Café in Eastsound Village. The setting is pleasantly located in the Outlook Inn in a charming enclosed porch looking out over the surrounding village and the bay. We were impressed with Executive Chef Steve Debaste whose menu has a French flair, harking back to his French heritage. Chef Steve made some good recommendations for dinner. New Leaf has an appealing list of small plates that in combination could certainly constitute a full meal. The chef recommended his favorite small plate, Octopus Carpaccio, which was outstanding with thinly sliced octopus that had been poached in sake, parsley, scallions, shaved celery, lemon, sea salt, and extra virgin olive oil. We also enjoyed fresh Dungeness crab in delicious Crab Cakes and creative Duck Mac ‘n Cheese made with gruyere and smoked cheddar. We shared the Lardon Salad with crisp greens, lardon bacon, garlic croutons, gorgonzola, and a warm Dijon-sherry vinaigrette. 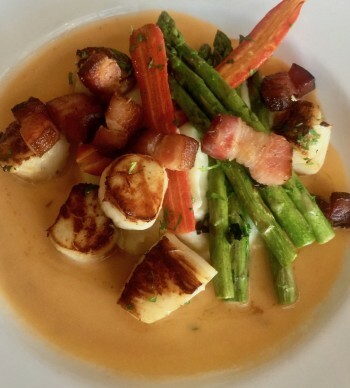 For entrees, Todd savored the Seared Scallops served with bacon, asparagus, mashed potatoes, and fresh tarragon beurre blanc. I really liked the savory Cauliflower Steak inventively prepared with melted cheese curds, a roasted tomato relish, Kalamata olives, olive oil, and lemons. It was so nice to take a leisurely, after-dinner stroll back to our Sea Star Loft accommodations. 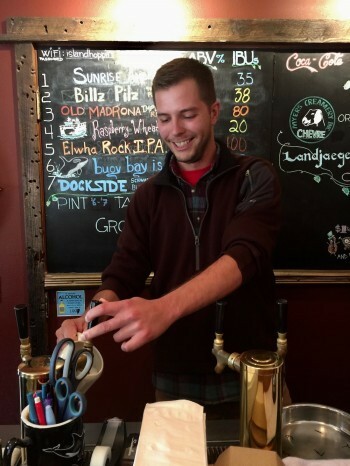 This craft brewery offers an ever-changing variety of local craft beers in a snug, welcoming setting. We sidled up to the bar and enjoyed chatting with the friendly “beer”tender. At his suggestion, we sampled a flight of exclusive, small-batch beers. We savored the unique flavors of the Elwah Rock IPA and the more mellow K-Pod Kolsch. I could just imagine spending the afternoon here chatting with the locals and soaking up the ambiance. An outdoor patio is also very appealing. And the cheese dip goes perfectly with the beers. There is a love story fermenting at this charming wine shop in Eastsound. 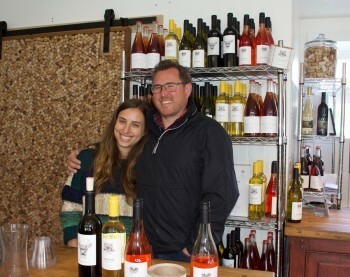 This love is between the entrepreneurial owners, Stephanie and Cole Sisson, and also reflected in the love they have for producing great wine, which shines through all their interactions with customers. Cole, a native of Orcas, brought his wife back to his hometown after they met on the east coast and took a whirlwind trip together to Oaxaca just days after they met. 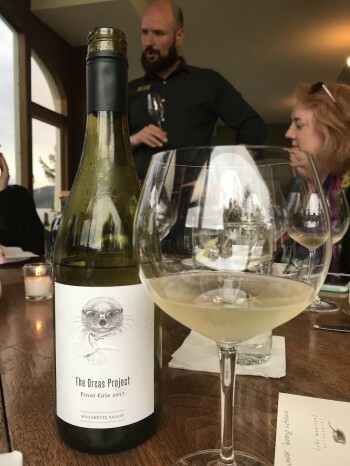 We were fascinated with their Orcas Project wines, a collaborative venture between Pacific Northwest vineyards and Orcas Island wine label designers. These wines are available at Doe Bay and also online at the Orcas Project website. We especially enjoyed the 2017 Pinot Noir Rose, which was light, fruity and subtly sweet. Cole was also our personable tour guide through his company, Salish Sea Tour Co. We enjoyed riding in his comfy Mercedes van as we toured throughout the island. He will conduct personalized tours designed for whatever interests his customers may have — from agriculture to shopping to nature to cuisine—or how about all of these? Girl Meets Dirt is a tiny shop selling unique organic preserves and other products made from fruit. Audra Lawlor, the owner, greeted us and told us her fascinating story about how she and her husband moved back to the Pacific Northwest (where she grew up) after ten years working on Wall Street. 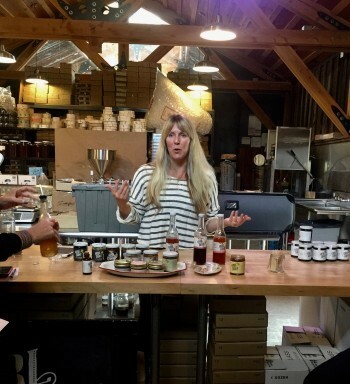 She founded Girl Meets Dirt with a passionate focus on producing spoon preserves (which are like jam but chunkier) made from fruit from the San Juan Islands and produced without commercial pectin. Many of the trees producing fruit are over 100 years old and all the preserves are made in seasoned copper pans right in the shop’s kitchen. We tried some of her delicious spoon preserves such as Pear Balsamic, Rhubarb Lavender, and Quince Marmalade. She also produces shrubs (fruity syrups used in cocktails, teas, and other drinks) such as Tomato Shrub and Island Pear Shrub. One of the highlights of our visit to Orcas was a stop at Buck Bay Shellfish Farm, where oysters, clams, and Dungeness crab are harvested and sold, along with homemade ceviche, salads, and other seafood. The enthusiastic and knowledgeable owner, Toni Hermansen, gave us a tour and showed us how to shuck oysters. 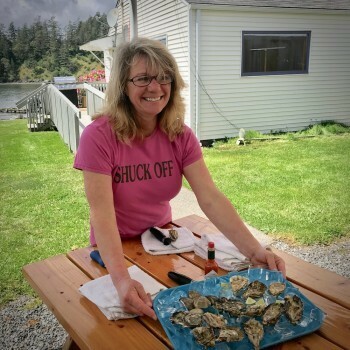 As we watched her shuck, we sat at picnic tables and enjoyed those freshly shucked oysters (so yummy!) along with a lunch of cheese, olives and wine that we had picked up the day before at Roses Café. It’s a good idea to call ahead to let them know you are coming. You can also stay all night in a comfy one-bedroom cabin right on Buck Bay. I can just smell the fresh air and taste those fresh oysters right now. We drove and hiked a bit around Moran State Park, the island's verdant, densely wooded 5,252-acre state park. Many of the park's trails are also perfect for mountain biking or horseback riding. You can easily climb to the top of the tower on Mount Constitution and be overwhelmed by the gorgeous, expansive views (see photo on right) and also hike the four-mile trail around serene and picturesque Mountain Lake. 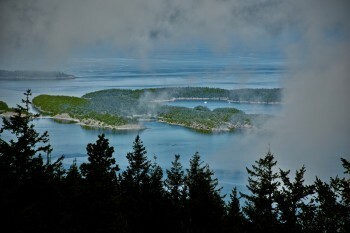 I will always think of Orcas Island when I am yearning for a peaceful getaway. It may be a bit of a challenge to get there, but that is part of the adventure. And when you are there you really feel as if you have escaped the hub-bub of city or suburban life. I will be back.